July 4, 1866. 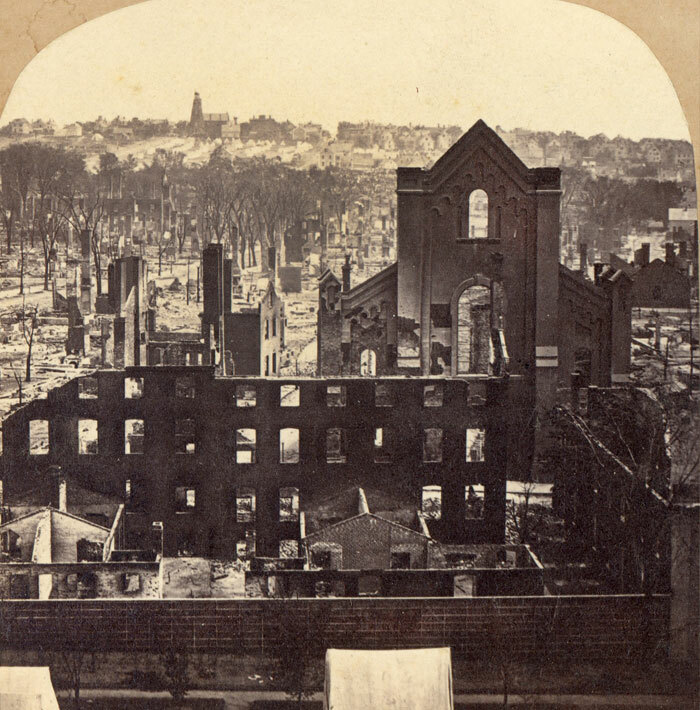 In one historic night 150 years ago, an intense fire swept across the peninsula and left more than 10,000 people homeless, 1,500 buildings destroyed and a third of the bustling city in smoking ruins. 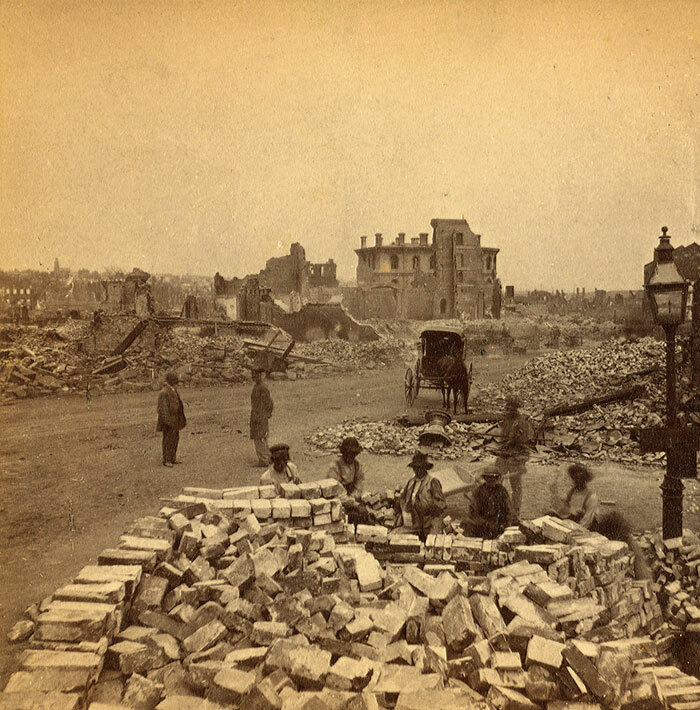 The Great Fire of 1866 would lead to national reforms and forever reshape a city still haunted by the flames’ legacy. Before the smoldering ruins of Portland’s Great Fire had cooled, city leaders were calling on communities near and far to send food, shelter and money to rebuild. Speedily and with aplomb, the city rebuilds a state-of-the art commercial district, with a reinvigorated reliance on brick and stone. Portland’s newspaper offices, like the city they covered, were destroyed in the Great Fire but rose from the ashes to tell the story. The Man Who Shouted "Fire!" William Wilberforce Ruby is remembered for his animated role in calling attention to the Great Fire, but he also went on to serve and lead the city. John Bundy Brown was the state’s wealthiest resident and Portland’s largest landowner, and he would not let the fire defeat him. 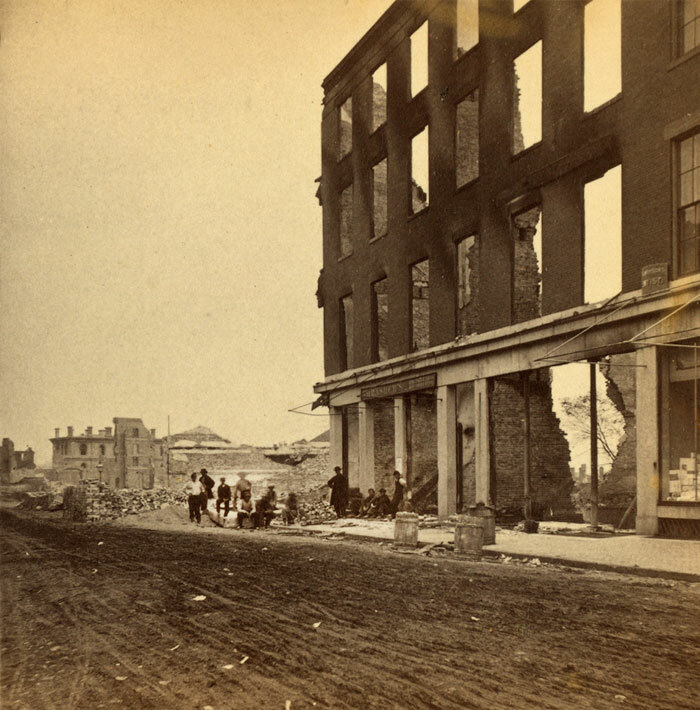 Poet Henry Wadsworth Longfellow and architect John Calvin Stevens are affected by the disaster in different ways. From beneath the rubble of City Hall’s evacuated jail, a faint cry is heard. Muff may have burned through his nine lives to survive the fire, and his story becomes part of Portland history. News of the fire spread throughout the country. These dispatches from Portland were published by the Daily Iowa State Register. 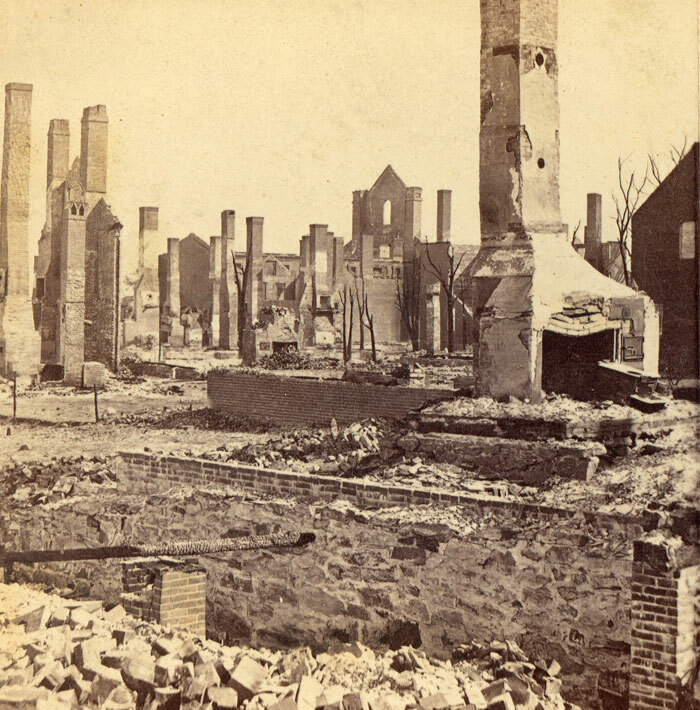 A terrible fire is raging here, having destroyed Brown's sugar house, and is sweeping through the city before a strong southern wind. The fire caught in the building above the sugar house on Commercial street, and has swept northerly through that street into the wooden buildings' between Centre and Cross streets consuming everything as it goes. J. B. Brown & Son's loss amounts to from $500,000 to $700,000. The fire has completely swept through the city destroying everything in its track so completely that the lines of the streets can hardly be traced for a space of one and a half miles long by a quarter mile wide. The Custom House being fire-proof, escaped, though greatly damaged. The court records in the upper story are probably destroyed. 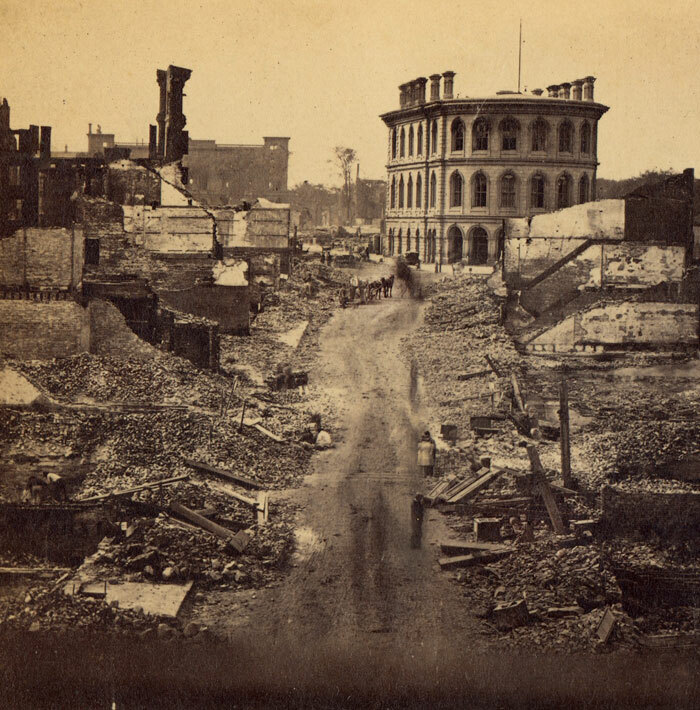 The splendid city and costly building on Congress street, which was nearly fire-proof and was considered safe, was swept away with all of its contents. The fire commenced a little below the foot of High street. It next burned Upham's flouring mill, and then Mr. Brown's sugar house, with all their surroundings, then Staples & Sons, and Richardson's foundries, and nothing else of a commercial character of consequence. Then a clean sweep of Cumberland street; and the same was the case with Congress street, and everything else to Free Street, and as far east as India Street. It is almost impossible to tell where the people lived, the ruin and destruction is so complete. 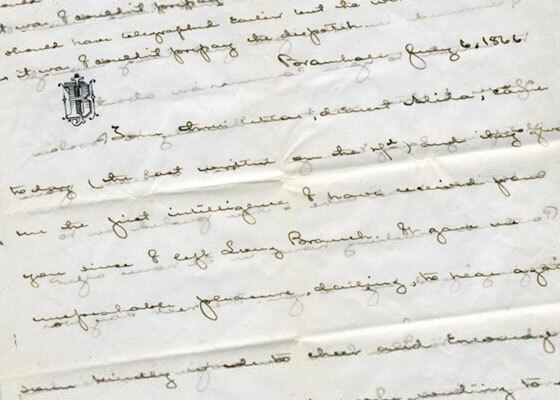 John Marshall Brown, a Portland native and son of shipping magnate and sugar manufacturer John Bundy Brown, wrote to his fiancee, Alida Carroll, of Maryland, on July 6, 1866, two days after the Great Fire of Portland destroyed a large portion of the city. One of the disaster’s lingering mysteries is laid to rest when the Portland Press Herald/Maine Sunday Telegram examines Portland’s original death records. The Great Fire leads to national standards for assessing fire risk, and it forges the city that survives to this day. 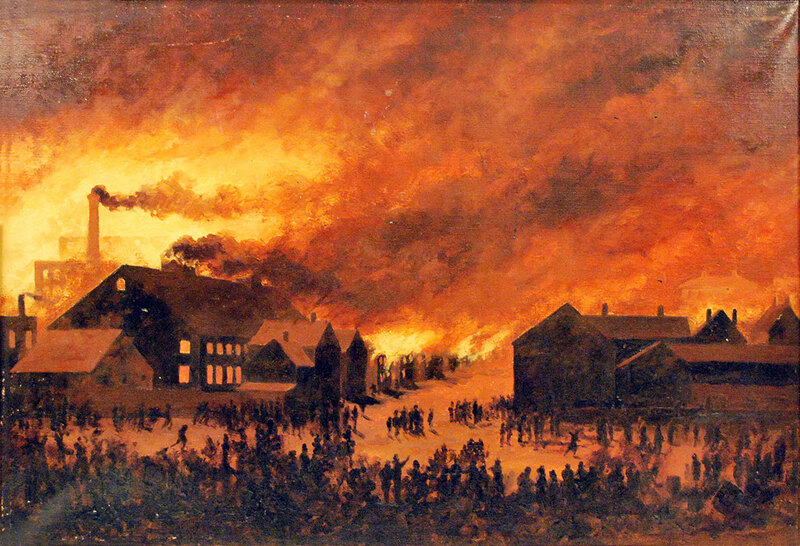 The burning of Portland was the worst urban fire in the United States at the time and remains one of history’s Great Fires around the world. A combination of ideal conditions fueled the Great Fire of 1866, and the city is far better equipped to prevent disaster 150 years later. Click a thumbnail below to enlarge. | Click to view more images. 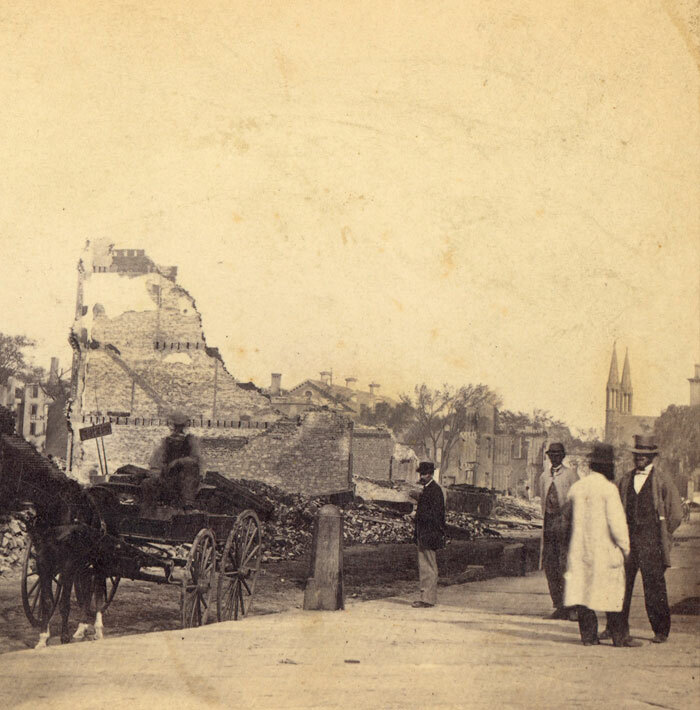 Take this virtual walking tour to see key places – as they appeared in 1866 and today – that tell the story of the disaster and its legacy. Click on a marker for details. 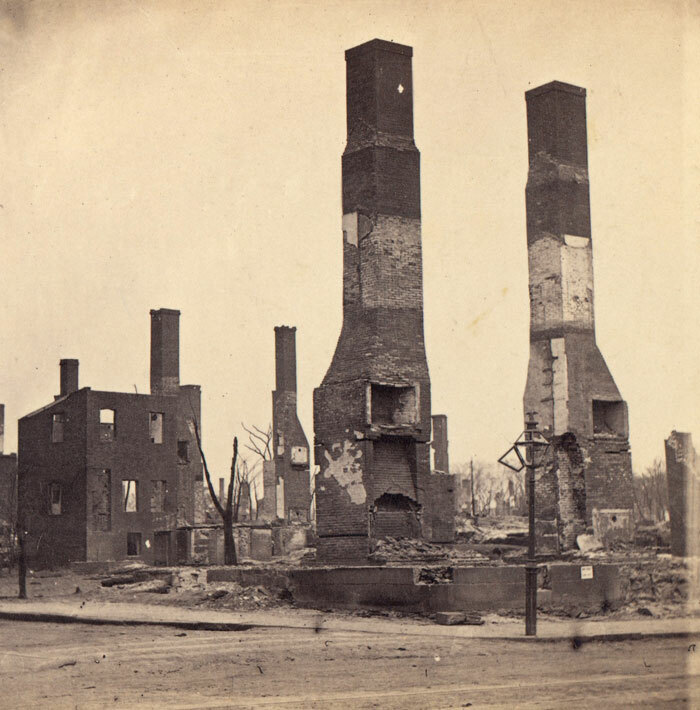 ‘THE FIRE THAT SHAPED PORTLAND – The 1866 Fire Tour’: Greater Portland Landmarks and local historian Herb Adams are offering a tour of the areas affected by the Great Fire of 1866. It will begin at Long Wharf, 170 Commercial St., and take place from 6-8 p.m. June 28 and 29. It will include trolley rides to City Hall, a walk down Exchange Street (weather permitting) and conclude with a trolley ride to the Portland Observatory. The cost is $40 per person, or $35 for Greater Portland Landmarks members. Space is limited to 30 people, so registration is required. Visit portlandlandmarks.org, or call 774-5561. 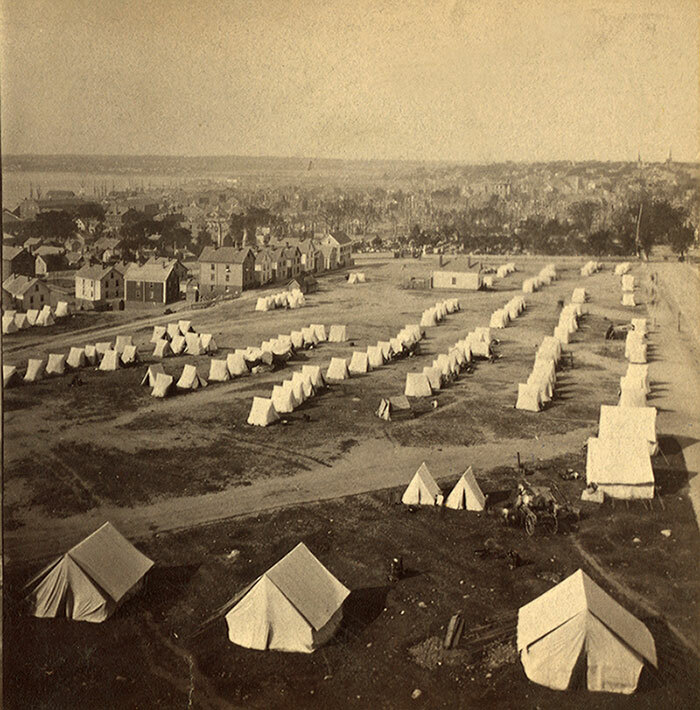 ‘IMAGES OF DESTRUCTION’: From June 29 to Oct. 2, the Maine Historical Society will be commemorating the 150th anniversary of Portland’s Great Fire of 1866 by hosting an exhibit featuring poignant imagery of the fire’s destruction to show how it dramatically affected the development of the city. 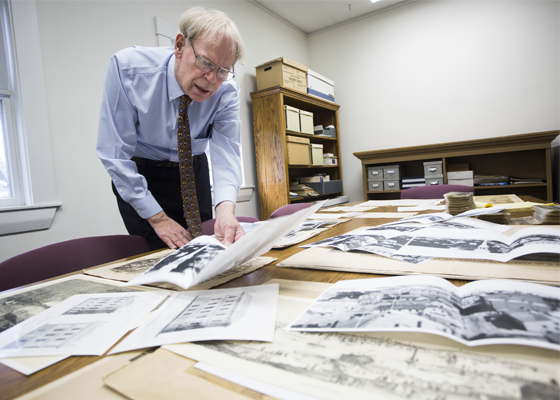 The exhibit, “Images of Destruction: Remembering the Great Portland Fire of 1866,” is curated by Maine State Historian Earle G. Shettleworth Jr. and will feature photographs of the fire’s aftermath, memorial paintings, maps, commemorative newspapers and objects that survived the fire. Maine Historical Society members and children age 5 and under can see the exhibit at 489 Congress St. for free. Admission is $8 for adults; $7 for seniors, AAA members and students; and $2 for children between the ages of 6-17. JULY 4th: The City of Portland does not have any official events or ceremonies planned to mark the 150th anniversary of the Great Fire, but the Portland Symphony Orchestra will explore the theme of fire during its performance of the “Stars and Stripes Spectacular” on the Eastern Promenade. 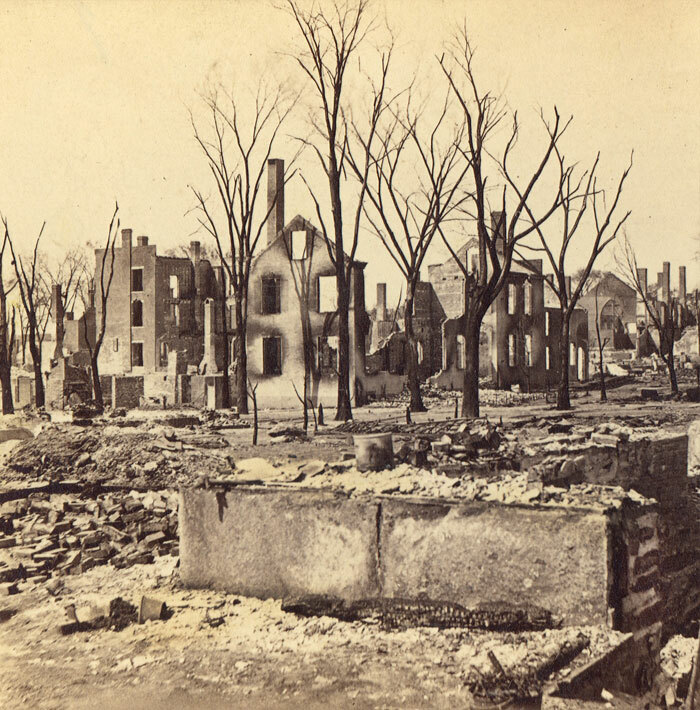 SHETTLEWORTH SPEAKS: On July 6, Shettleworth will give an hour-long lecture on The Great Fire of 1866 at the Maine Historical Society, 489 Congress St. Starting at 6 p.m., Shettleworth will examine the cause of the fire and why it was so destructive, as well as its impact on residents and how the city recovered. Admission is $5 for members and $10 for nonmembers. For more information, call 774-1822.